Join in the festivities on Saturday, December 1 from 11:00am - 4:00pm at the Furnace Town Heritage Village Christmas in the Forest celebration. Come enjoy a day of Family Fun with crafts, live music, wreath making, gifts, raffles and an old-fashioned Christmas Service. Admission to the event is $5 for Adults with Children 16 and under free. Call us at (410) 632-2032 for more information. The blacksmith was an essential part of 19th-century communities. Discover the basics of this artistry in the Furnace Town beginner blacksmith class. Using our 19th-century style forge, you’ll learn to make and take home a J-hook, and more if time permits. You’ll learn the interesting history of Furnace Town’s furnace, blacksmith shop and its collection of nineteenth-century blacksmith tools. No experience necessary. You will gain knowledge and confidence to explore the world of blacksmithing. Please wear closed toe shoes, natural fiber clothing, and lightweight leather gloves. If you have clear safety glasses please bring them, or a pair will be provided. Equipment, materials, water & soda provided. Please bring a lunch. Join Chesapeake Ghost Tours for a 1.5 hour paranormal investigation at Furnace Town in Snow Hill. You’ll tour our restored historic buildings all of which have had paranormal activity around them for years. Group will be able to enter the old Church – home of the “Heavy Bible” and also investigate around the old iron furnace, but the highlight will be walking into the secluded (and haunted) Pocomoke Forest. Sightings of Sampson Harmon, a free Black man who worked at the iron furnace and lived in the forest with his cats until he was 104 years old have been known to occur. Some people catch a glimpse of his cat. Harmon is one of over a dozen legendary spirits said to haunt the Pocomoke Forest. This forest has a 200 year legacy of of being haunted, and it is by far, the most haunted forest in Maryland. 29th Annual Chesapeake Celtic Festival! A great event for the whole family -- Celtic Dancing, Celtic Bands, Bagpipes & Drums, Storytelling, Artisans, Historic Ales & Specialty Beers, Whiskey Tasting, and much more! Put on your toe-tappin' shoes and join us for our Barn Dance. We'll start the evening with a crash course on square dancing with caller Dennis O'neil and the Pine Steppers Square Dance Club demonstrating basic hoedown moves. Then the real party begins! As the music plays and a caller calls out the moves, guests will experience a fun night of modern square dancing in a historical setting. Bring the whole family for a great night of down home wholesome fun. Experience the traditional art of weaving in our Introduction to Weaving Class. This two hour course will cover all the basics of weaving. You’ll learn how to plan a project, and create a one of a kind place setting. All participants will make their own penny rug, hot pad, or place setting to take home. No prior skills required. Discover the art and beauty of handmade brooms! Furnace Town residents made different small hand brooms for different purposes. Using one of the oldest broom making methods, you’ll learn to make a variety of small hand brooms. Participants will take home 3 small hand brooms. You’ll learn the interesting history of Furnace Town’s broom house and its collection of nineteenth-century broom making equipment. No experience necessary. You will gain knowledge and confidence to explore the world of handcrafted brooms. Please wear closed toe shoes. All equipment and materials provided. Class: Limited to 6 participants ages 10+. The Nassawango Bluegrass Festival is a place for pickers to come together and celebrate the music that we hold dear. We hope you come and pick with us September 7-8, 2018. Enjoy live music, camping with friends, all day & all night jam sessions, delicious local craft beer, local artisans, and amazing BBQ! Overnight camping available Friday, September 7 or Saturday, September 8. The Nassawango Bluegrass Festival is located at Furnace Town Living History Village. Furnace Town is located in the Pocomoke Forest on over ten acres brimming with history. Rough tent camping will be permitted within Furnace Town in the designated camping area. This will be on a first come first serve basis. We will also offer a select few RV spots. We are a historic site; no open fires are permitted inside Furnace Town’s gates. We will have plenty of lighting for all-night jams. Bluegrass Boot camp will be held all day Saturday. This one day camp will give young pickers a chance to hone in on their skills. As well as give them a bluegrass mentor for the day. Hosted by Glenville State College. The Nassawango is an outdoor event and is RAIN or SHINE! Friday: Grounds Open at 10am. 24 Hour Reentry. Saturday: Gate opens at 10am for non-campers. 24 Hour Reentry. Experience the traditional art of weaving in our Advanced Weaving Class. This three hour course will offer a refresher on the basics of weaving, and introduce you to a more complicated warp and weft. All participants will make their place setting or table runner to take home. Some prior weaving experience preferred, but not required. We can accommodate up to eight people ages 8 and above. Give us a call (410) 632-2032 to sign up or click the REGISTER button below. Step back in time at Folk School Heritage Days. Explore and discover our rich cultural heritage where there it’s fun for the whole family! Sign up for one of our Folk School classes, join in a hands-on-history workshop, or watch one of our demonstrations. Visit one of our artisans: blacksmith, broom maker, gardener, or weaver. This summer Furnace Town will be hosting Camp Nassawango - a 5-day camp where children learn and explore the history and natural wonders of Delmarva. Let them take a step back in time as they learn 19th-century trades and culture. Campers will learn how children of the past learned, worked and played in a fun and friendly atmosphere. Not only will campers get hands on experience with history, but they will also learn about the wonders of nature around Nassawango Creek. Camp Nassawango is appropriate for ages 8-12. The cost is $20/day and each day the camp starts at 8:00am and ends at 5:30pm. Lunch is not included. We're flexible - let us know if you would prefer a shorter week, or only a couple of days of the camp. Just give us a call. Please contact Sarah Campbell for more information or if you have any questions at scampbell@furnacetown.org. Our goal is to have our younger generation excited and talking about history, cultural heritage, and science - and to provide memories that will last a lifetime. Funding for this event is in part provided by the Worcester County Arts Council, Maryland State Arts Council and the National Endowment for the Arts, organizations dedicated to cultivating a vibrant cultural community where the arts thrive. Additional funding provided by the Lower Eastern Shore Heritage Council and Maryland Heritage Areas Authority. For our third performance we welcome John O’Dell & Windy Ridge - Scott Walker, Banjo; Brad Sams, Bass; John O’Dell, Guitar; David Probst, Mandolin; and Tom Lyons, Fiddle. 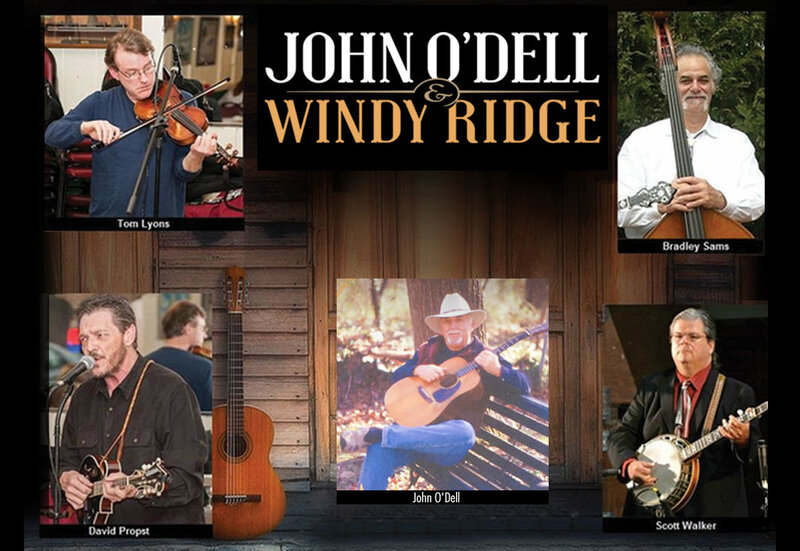 Over the last 35 years John O’Dell & Windy Ridge — as well as the Good Deale Bluegrass Band, of which John O’Dell was a founding member — have been entertaining audiences with traditional Bluegrass and classic country music at some of the nation’s premier venues. Places like; Wolf Trap, The Kennedy Center, The Avalon Theater, The Birchmere, The Ram’s Head, Luckett’s Schoolhouse, and the Globe Theater, and festivals like Gettysburg, Pa., Watermelon Park, Va., Deale, Md., Union Grove, N.C., and Ocean City, Maryland. In addition, their songwriting and musicianship has afforded them the opportunity to produce three critically-acclaimed albums and to perform at hundreds of municipal, corporate, government, major league sports, and university-sponsored events, TV, and radio broadcasts. Enjoy cold crisp local craft beer from Evolution Craft Brewing Company and Tall Tales Brewing Co. and hot delicious BBQ from Backyard Louie’s BBQ and NoBBQ available for purchase while you watch the show.